Etrusco Olive Pool Table - 7ft, 8ft, 9ft, 10ft, 12ft | Free Delivery and Installation! The Etrusco Olive Pool Table comes with Free Delivery and Installation (worth £500), over £100 of Free Accessories, plus we are the sole authorised UK retailer. The Etrusco Olive is available as an English pool table using 2” red and yellow balls, or an American pool table using 2 1/4” spots and stripes balls as standard, with a sectional slate bed, available in 7ft, 8ft, 9ft, 10ft and 12ft sizes. The Olive has a classic design, and great playing characteristics. You can choose between regular or irregular sides; the regular sides are straight like most pool tables, while the irregular sides echo natural wood shapes. The Olive is designed to be a beautiful and elegant piece of furniture as well as a pool table, instantly recognisable as Etrusco's work. This table is supplied with or without a dining top. Should you decide to have a dining top you can choose between wood, glass and plexiglass. 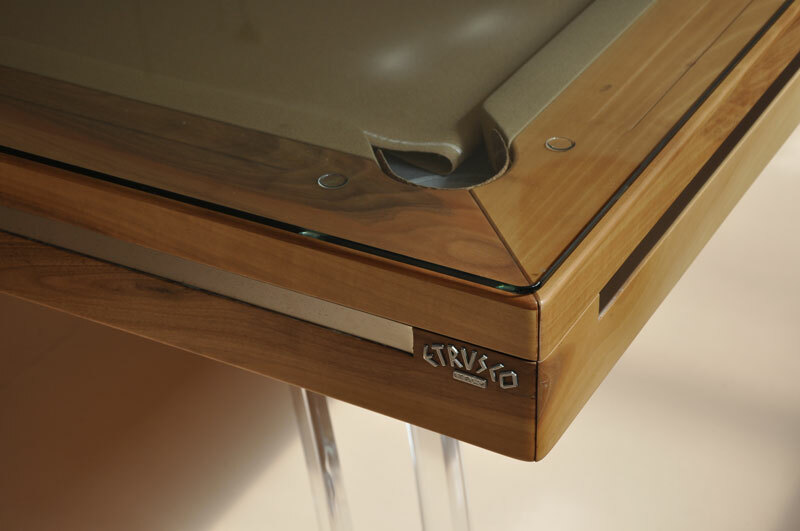 Etrusco make possibly the finest range of solid wood pool tables available in the market at present. The Smile comes in a wide selection of sizes: there are five different sizes ranging from 7ft to 12ft. We are able to offer the Olive in a choice of 11 different sizes, enabling you to select the optimum size for the space you have or type of cue sports you prefer. The Olive features a natural wood finish, which looks stunning. Should you require a particular stain to be applied to the wood to make it darker, lighter, or natural please call our expert sales team to discuss your requirements. We can also offer varnishes which are either gloss or satin. We can supply the Smile in a huge choice of finishes; virtually anything is possible. The Olive is available with a choice of either Regular or Irregular cushions. Please see the photos above for more details, and choose the option you want from the drop-down menus.